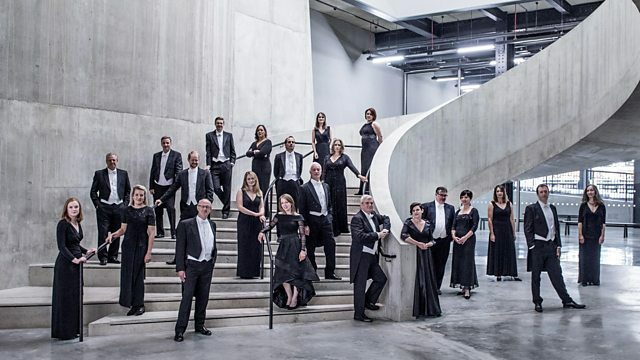 The BBC Singers perform choral works by Salonen and his teacher Rautavaara plus virtuosic instrumental works performed by musicians from the Guildhall. Total Immersion Esa-Pekka Salonen. The BBC Singers in choral works by Salonen and his teacher Rautavaara; plus virtuosic instrumental works performed by musicians from the Guildhall. In Part 1 of tonight's focus on the music of Finnish composer and conductor Esa-Pekka Salonen, music by teacher and pupil, complementary but distinctive, sits side by side. Einojuhani Rautavaara, who died in 2016, was one of Esa-Pekka Salonen's teachers in Helsinki and this concert juxtaposes choral works by the two men. Conductor Nicholas Chalmers joins the BBC Singers for a programme of music set to texts that range from the Mass to Dante (2014's Iri da iri). Rautavaara's Our Joyful'st Feast sets English words with glorious results while his Missa a Capella (2011) builds on an earlier setting of the Credo from 1972. The concert opens with two songs setting the poetry of Ann Jäderlund, music of great sensuality that hearkens back to the counterpoint of Palestrina. In Part 2, Musicians from the Guildhall School of Music and Drama platform Esa-Pekka Salonen's dazzling smaller-scale instrumental works, which reveal, as if under a microscope, his fascination with the intricacies of music. His 17-minute Dichotomie, written in 2000, 'deploys aggressive but constantly shifting rhythmic mechanisms whose origins lie in Prokofiev, while its second [movement] seems closer to the flowing spontaneity of the Ligeti Études' (Gramophone). And the three works featuring wind instruments are also powerful additions to the modern repertoire. Choir: BBC Singers. Conductor: Nicholas Chalmers. Performer: Bernice Lee. Performer: Ljubica Stojanovic. Ensemble: Musicians from the Guildhall School. String Quartet No. 2 "Pulse of the Lights"